On my annual visits to see Uncle Regis in San Francisco, I had developed a habitual 1-day walking tour, which I embarked upon every single trip. The route began with dim sum at Yank Sing in the Rincon Center, followed by a pilgrimage to the Ferry Building Marketplace, and then a leisurely stroll along The Embarcardero all the way to Fisherman’s Wharf. The final destination was a kitschy conglomerate of tourist traps, but I just couldn’t help myself. My motivation was twofold; to pass by Pier 39 to see the famous sea lions (sadly, there aren’t many left) and to have my clam chowder in a sourdough bowl. What can I say? I’m a sucker for tradition. Visits were always around Christmas Time, when the weather was actually quite cold in San Fran. The Bay Area never gets too hot, really. So I always looked forward to the warm, creamy, and hearty reward at the end of the journey. 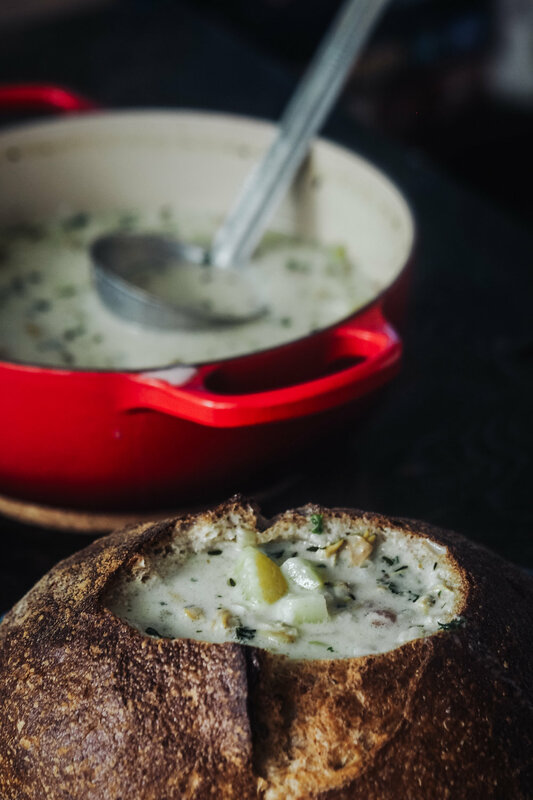 And now, as the weather begins to cool and with our household never without sourdough, I began to crave the chowder. Of course, one of the first recipes I tried was the clam chowder. On a diet from all the holiday gorging, I opted for the light version of the recipe contained in the same book. I recalled making it again quite a few times, though with many adjustments. Since the recipe was based on a lot of standard American packaged goods, finding the equivalent in packaged quantities proved to be a challenge. Without a food scale at the time, the first couple of attempts resulted in a bit of a crowded mess. Too many clams, too many potatoes, very little soup. But I persevered; the flavour was great. I recently dug up the cookbook, with post-it notes for substitutions intact, and succumbed to my craving. Mind you, this is a modified version of the light recipe for those who prefer their chowder a little less thick like I do. 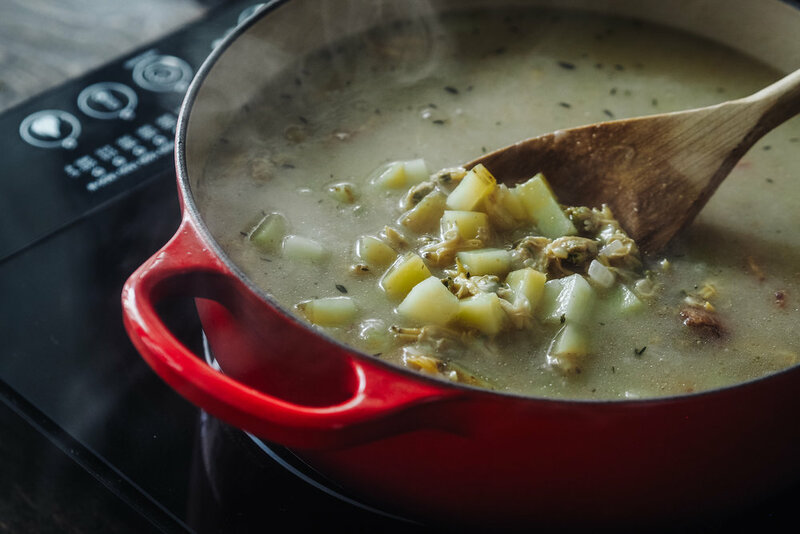 For those of you who prefer a slightly thicker soup, I’ve included a couple of modifications for you below. For the bread bowl, ordinarily, Nick would’ve prepared a loaf had I not been so impatient. So this time, we bought a whole wheat sourdough boule from Blackbird Baking Co. in Kensington Market. 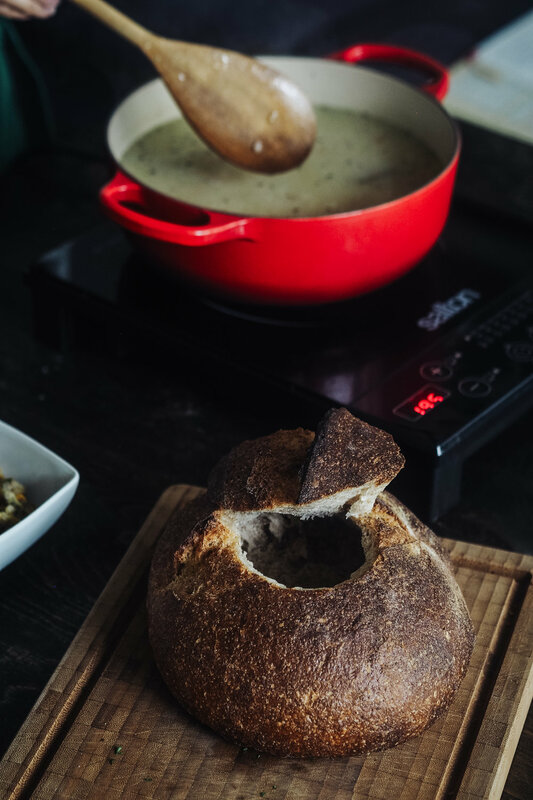 If you’d like to try your hand at making your own sourdough, you can check out our recipe here. Lastly, yes; the recipe uses canned clams and not fresh ones. Judge all you want, but if you want to spend all that money on fresh clams and have the time to cook and shuck them, be my guest. The good people at America’s Test Kitchen tried both fresh clams and canned clams and found very little difference in quality. Drain the clams, reserving the juice. Combine the reserved juice to the bottled clam juice and add water as needed to measure 6 cups. 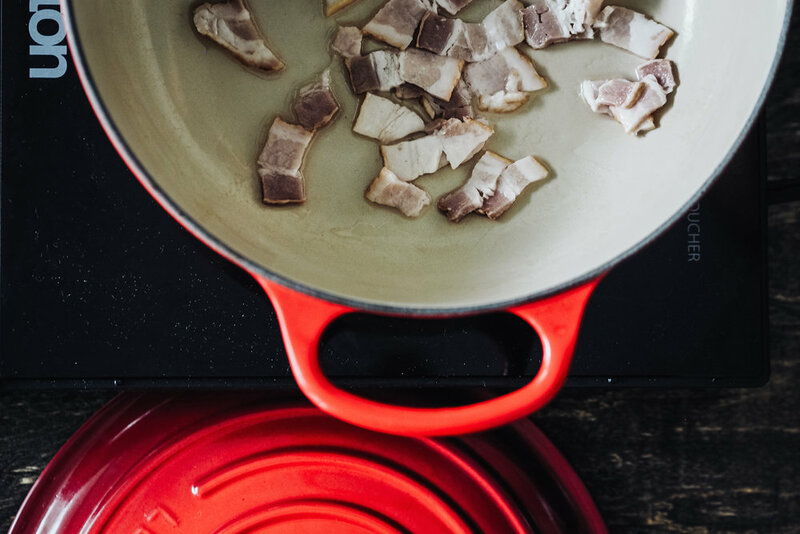 In a Dutch oven, cook the bacon over medium-low heat until it starts to crisp. Stir in the onion and cook until the onion is soft and translucent. About 8-10 minutes. Stir in the flour and cook for about a minute, coating the onions and bacon. 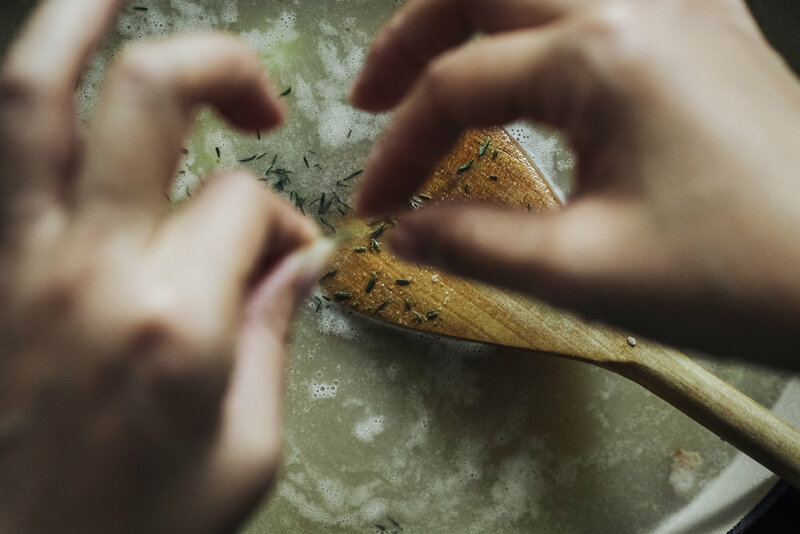 Gradually add the clam juice, stirring frequently to dissolve the flour and maintain an even consistency. Add the potatoes, bay leaves, and thyme. 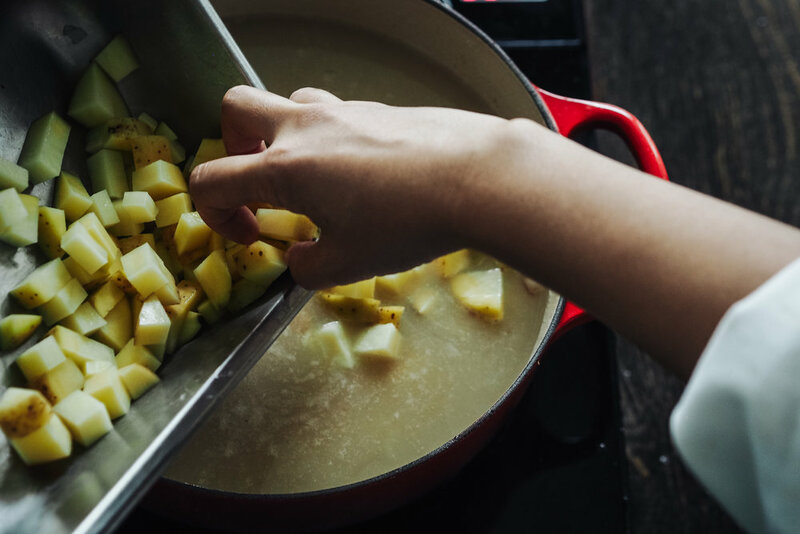 Bring to a simmer and cook until the potatoes are tender. About 15-20 minutes. Stir in the clams, cream, and parsley. Return the soup to a simmer for a couple of minutes, then remove from heat. Remove the bay leaves. Season with salt and pepper to taste. 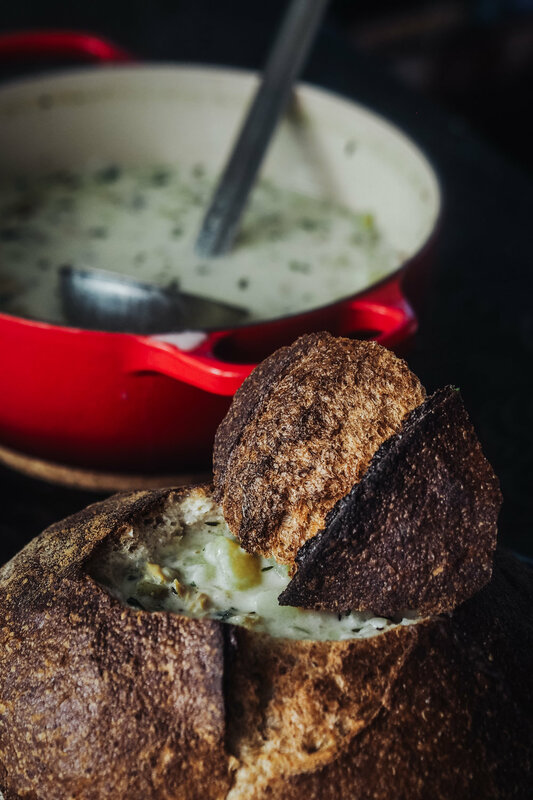 For the bread bowl, the size of the circle depends on the size of your boule. Cut a circumference that would at least easily fit a large ladle. If the hole is too big, it won’t be able to contain the soup. Next, dig out some of the crumb to create some space inside the bowl. Be sure to keep about 1 inch all around to make sure that the soup doesn’t seep through. You can make some croutons with the excavated crumb with some olive oil, thyme, and garlic. Ladle the soup into the bowl until full. Serve. Words by Kimberley Kwo. Photos by Abhishek Dekate.